With Mother's Day right around the corner we figured it was the perfect opportunity to bring back our Purring Peddler feature. We've been scouring our favorite online stores and have found some things we think every mom (of both 2-legged and 4-legged babies) would love to receive on their special day! Mommy sure has her eye on that necklace...I hope I've saved enough green papers to get it for her! These are sweet picks! My human likes that necklace lots too. And while she is choosy about scents, she does really love that perfume bottle! I may or may not be drooling over these adorable finds. That necklace is my favorite, too. And that soup bowl mug, it's just too cute! 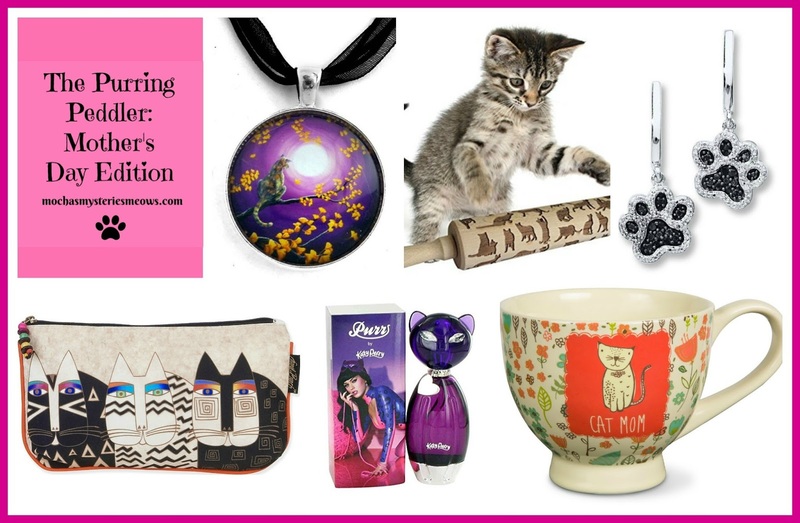 You always share the most purrfect gift guides, Mudpie and Melissa! What great finds! That necklace is especially pawesome. Great gift ideas!! Mom has a Laurel Burch cosmetic bag similar to that one. She uses it for her coloring pencils! Great gifts! The necklaces are awesome! I'm in love with those earrings!!! And that perfume bottle is something else, isn't it? Those all look like great gifts, your mom has good taste. Those are great Mudpie. We was just meowin' 'bout what to get mommy fur Mother's day. Dat necklace sure is purretty. Big hugs and fans fur comin' to Raena's pawrty.